Ghost Radar Classic iPhone Apps Review. AppleRepo.com, There are many people who believe in the activity of paranormal, where under this nomenclature refers to the presence of ectoplasm in a given place. On these activities has focused the attention of the media, television and science, then Apple could exempt themselves from affecting? Ghost Radar is presented as an application for iPhone and iPod touch that allows those who include it in their iDevice to detect the presence of ghosts in the area. The Ghost Radar Classic application for iphone, ipod touch and ipad respond to sound waves and is recommended by the same development team to operate it in absolute silence to learn the true (or assumed) signals from beyond the world. You can also hear what they say in the form of words that the application would be able to translate. So if you enjoy playing Ghostbusters this ghost radar application comes as a pleasant pastime that you can also try with friends for some fun, but nothing more than that. For Me, I do not believe in Ghost, so I just try it for fun and curious what is the inside of this ghost radar. 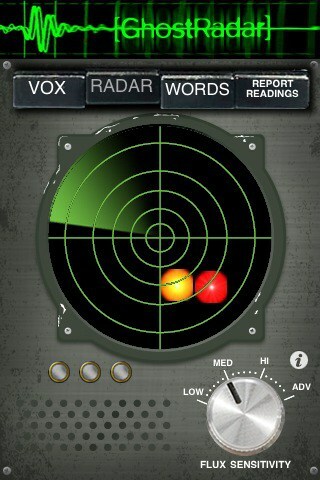 Download Ghost Radar Classic iPhone App here.